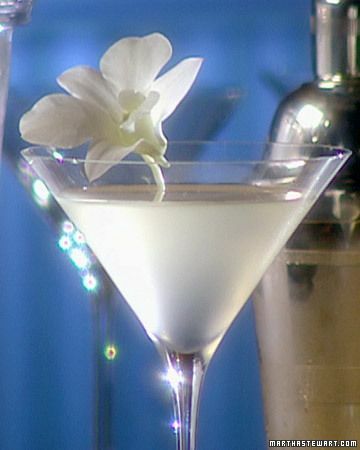 In the spirit of Spring we are drooling at this beautiful and delicious White Cosmopolitan Martini … you can’t go wrong with elderflower liqueur! Perfect for your bridal shower or engagement party. There’s no fear of staining your cocktail dress with this cosmo — it’s made using white cranberry juice. The recipe is from “Cocktails and Amuse Bouches,” by chef Daniel Boulud and mixologist Xavier Herit. Place orchid in a 2-inch round ice ball mold; fill with filtered water and freeze. Fill a cocktail shaker with ice cubes. Add vodka, elderflower liqueur, cranberry juice, and lime juice; shake vigorously to combine and strain into a small carafe. 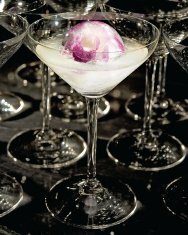 Place orchid ice ball in a coupe; pour vodka mixture over ice ball. Serve immediately.